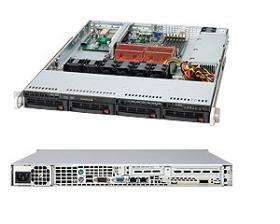 Acme AG-104TF 1U Opteron 6200/6300 server. AMD Opteron 6200/6300 with 1U rackmount black. option to add riser card, one PCI-e x8 (in socket x16) slot. 1U RackMount case with 300W power supply. 4 of 3.5" HDD bays, SAS/SATA hot-swap, backplane included. Option to have 1 slim DVD and 1 floppy bays. CPU cooling kit included. Rail set included. Width: 16.7 in. Height: 1.7 in. Depth: 19.8 in. *** Processor, Memory and hard disk drive are not included.